This month we welcome Austin SCBWI member Mari Mancusi to our interview series. Mari writes across many genres and is generous with advice, drawing on her years of perseverance and success in the industry. For someone who publishes often and well, Mari has learned the value of taking some time off to refill the well. We hope you take the time to stop and read her words of wisdom. Thank you Mari, we're so glad you're here. I grew up in Massachusetts, just 30 minutes north of Boston, on a street that dead-ended up against a cemetery. We used to play in the cemetery all the time as kids, which didn’t seem odd at the time. But when I tell people now they usually say something like, “Ohhh, that explains a lot!” Ha, ha! That said, I often set my stories in much more exotic locales around the world. In the Blood Coven Vampire series, for example, I wrote books set in Las Vegas, England, Germany, and Japan. I like traveling to places and then writing about them in books. Sadly, I still can’t find a way to travel back in time. So for the time travels I’m forced to use my imagination and Google. I don’t know if I thought about writing as a career early on, but I was definitely always doing it. Even when I was too young to put words down on a page I’d draw pictures and dictate the accompanying story for my mother to transcribe. When I grew older I would write fan fiction for my friends in school starring them and the rock stars who loved them. I’d pass them around during class for entertainment. They’d always beg for new chapters which got me hooked on writing for an audience. I’m a mom to a six-year-old so much of my non-writing life is dedicated to her. She’s very creative as well, always coming up with these amazing story ideas that I kind of want to borrow and write myself! When she’s at school I write and work on marketing my books. I’m also an avid cosplayer so I’m often working on one costume or another. 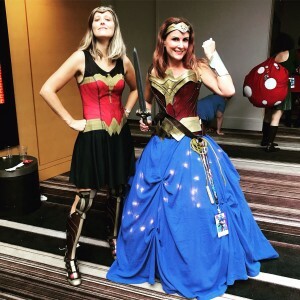 As I write this, for example, I’ve been creating the bracers for my “ball gown Wonder Woman” mash-up costume I’m debuting at DragonCon. At night you’ll probably find me either reading or catching up on one of many TV shows. Or maybe playing videogames! I am very fortunate to be able to write full time while my daughter is in school. I also often wake up early and write, as I find the predawn hours the most creative for me and the least distracting. I’d rather wake up and write at 5:30am and then take a nap later than sleep in. That said, I always try to take some time out of the day for “me.” Whether it’s watching something on TV or swimming in the pool or reading in the bath. I think that’s important when playing the long game. I see many authors getting burnt out after busting their butts and I don’t want that to happen to me. I’d rather write a little less each day and be able to wake up and do it again tomorrow. Most people love to hear that I have two Emmys for my work in television news. However, my proudest accomplishment was when I got on the “Quick Picks for Reluctant Readers” list that the Young Adult Library Services Association (YALSA) puts out every year. Two of my books have made this list and that means so much more to me than a shiny golden statue. To know my books are reaching and appealing to kids who might never otherwise pick up a book? It’s like, my work here is done! Probably how often you have to give yourself permission to refill the well. I am a bit Type A and always want to be working and moving forward, meeting deadlines, getting things done. But there are times I will sit in front of a computer and stare at a blank page, thinking I’ll never write again. I’ve had to learn that this is okay. It will come back. It always does. But sometimes you have to take time off, refill the creative well. 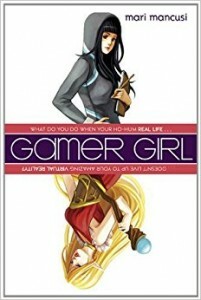 When I wrote GAMER GIRL, I really poured my heart out into the book. It’s my most autobiographical story about a time I was bullied in junior high. When it came out I got bombarded with letters from kids saying they were “just like Maddy!” and that they had been bullied, too. But after reading GAMER GIRL, they decided they would start standing up for themselves just like she did in the book. It made me so proud to know I was able to turn something terrible that happened to me into something good. Giving other kids a happy ending I wasn’t able to get myself. 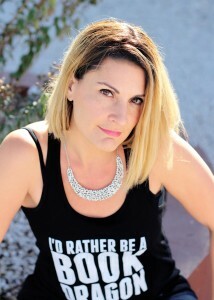 Author Bio: Mari Mancusi is an Emmy Award winning television producer and author of books for kids, teens, and adults. Her books have been chosen as Indie Next Picks, Scholastic Book Fair Featured Selections, and Quick Picks for Reluctant Readers by the American Library Association. 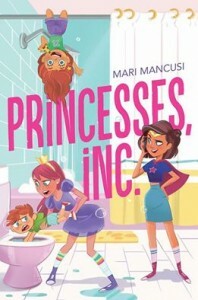 Her newest middle grade novel, Princesses, Inc., has just been released by Simon and Schuster and she has a new Arthurian time travel series coming from Disney Hyperion next year. 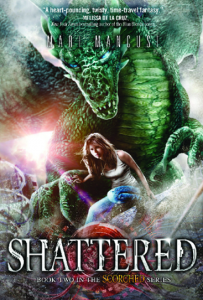 In addition she writes the Excusive Romance series for Berkley Books. At First Light, the third book in the series, was released in March of this year.